In my last post, I asserted that today’s technology executive needs to play the role of the Chief Change Management Officer (CCMO™) in leading his or her organization on the Enterprise Cloud Journey. This post explores the first of three themes associated with this responsibility: merging business with technology (managing across). The other two, providing clarity of purpose (managing down) and making (breaking, really) new rules (managing execution), will be explored in my next posts. Today, more than ever, successful technology executives must help their executive counterparts understand how technology fits into — or, even better, powers — their business. Providing the organization with this understanding will illustrate to your executive peers that you have a command over your organization’s business objectives and that you’re a critical member of the executive team. The current business landscape is being disrupted by companies that are built and run by executives and entrepreneurs who not only understand how technology fits into their business, but who are also defining the role technology plays across entire industries: AirBnb for hotels, Uber for car services, Nest Labs for home automation, and Dropbox for storage are just a few examples. While this creates pressure for traditional enterprises to keep pace, it also creates an opportunity for IT executives everywhere. No one is in a better position to translate how technology can meet the increasing demands of the marketplace than those who have spent their careers working in technology. This is especially true for those of us who have been working in large companies for most of our careers. We speak the enterprise lingo, understand what constraints are hard and which are soft, and what levers you have to pull for each of your C-level peers. Companies can no longer expect to be successful with their technology executive(s) working behind the scenes. And, because the cloud takes away much of the undifferentiated heavy lifting traditionally associated with enterprise IT, today’s IT executive can leverage it to devote more time and resources towards the activities that drive the business and keep the the organization competitive. The cloud is a key ingredient being used by these new disruptive forces. Using the same ingredient won’t necessarily give you the ideas you need to grow your business, but it will even the playing field while opening up additional possibilities. The cloud is more than a technology shift. It’s a business shift, and one that everyone at the executive level should care about. It’s your job to consider your executive team and how its functions are impacted, or could be impacted, by the Journey. CFOs are typically attracted to lower up-front costs and the ability to pay only for what you use. I’ve seen some friction around the variability of costs from month to month, but I almost always find that the total cost of ownership is lower, especially when you’re freed from the burden of capacity planning and maintenance activities. Work closely with your controllers every month as you learn more about your environment to forecast spend, govern resource utilization, stagger the purchase of Reserved Instances (RIs), and consider how you capitalize labor costs as more of your resources become focused on product development (creating assets) over time. CMOs are typically looking to keep the company’s brand fresh and respond to changing market conditions. What would the implications be of being able to update your brand website several times a day instead of once a month? How would an infinitely scalable data warehouse help CMOs better understand their customers? What experiments might they try with a small fraction of their users if it cost little to nothing to try? VPs of HR will want to see that you’re looking after your staff properly and how you’re hiring for new skills. Take advantage of AWS Training and Certification, and feel free to make our training expertise a part of your own training curriculums. I will explore how to educate your staff in an upcoming post dedicated to this topic, and – spoiler alert – everyone on your team can help you make the Journey if they’re willing to learn. Also, network with other companies who are on the the Journey to find out about how they’re hiring for new roles and managing the transition with existing staff. For example, how does DevOps fit into your organization, and what would it mean to run-what-you-build? CEOs care about all of these things, and how the company will stay competitive. Use what you learn from the other executives to help shape a complete vision, and show how, by leveraging modern technology, you’ll be able to do things that would not have been possible given the same constraints. At Dow Jones, I set a goal to take a few executives out for a meal each month. During the time we spent together, I did nothing but listen to their frustrations. I used what I learned to adjust our strategy, and made sure that I communicated back to them how their influence altered our direction. This is a simple (and enjoyable, if you like people and food) way to show empathy toward their needs, build trust, and earn their support. The key here is not just to listen, but to also take action based on what you learn. You don’t have to do this alone. Think of your account managers as shepherds for your Journey. They’re happy to work with you and your executive team to help shape the message around and benefits of moving to the cloud so that it aligns with your business. If the influence you need is beyond the scope of the account manager’s expertise, they’ll find the appropriate people, whether they’re inside or outside of AWS. We’re happy to create opportunities for you to network with like-minded peers — not just at our events, but at any juncture in your Journey. I had several reference calls with other companies in my last role, and learning from other executives is both educational and validating. The AWS Partner Network and AWS Training and Certification are also great resources to help you accelerate your Journey. I’ll touch more on these when I address them as best practices in their own right, but I find a lot of companies that partner with their HR departments to institutionalize AWS training on top of our programs. At Dow Jones our DevOps team partnered with HR to develop DevOps days that they regularly held to evangelize our evolving tools and best practices. This is a great way to scale skills across a large and geographically distributed team. Again, your account managers can help make the right connections across both of these areas. I talk to a lot of IT executives that aspire to improve their department’s brand. I spent more than a decade of my career developing software that drove the business at Bloomberg. One of the reasons I moved to Dow Jones was to help them shift the mindset away from IT being a cost center and toward a discipline that drove and empowered the business. I felt that I owed it to every person in my department for their hard work and dedication, and it was very helpful in getting them on board with the changes we were making. AWS was part of the foundation for making this shift, but most of the hard work at the executive level revolved around understanding each executive’s pain points, what they wanted to get out of IT, and aligning technology to help them meet their goals. After a few months of using the cloud to deliver better results faster, we spent several months retraining the executive team and their departments to refer to us as technology instead of IT. It may seem subtle, but it made a meaningful difference in the tone and productivity of our conversations, and signaled a changing contribution by the department to the overall company. How does this match your experiences? I’d love to hear about them. 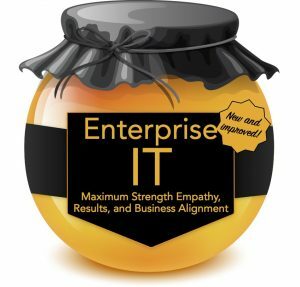 Note: Providing executive support is the first of seven best practices I’m writing about in my new Enterprise Cloud Journey series. The remaining six are: educate staff, create a culture of experimentation, engage partners, create a center of excellence, implement a hybrid architecture, and implement a cloud-first policy. Stay tuned for more on each of these.